When the news surfaced that Pharrell Williams and Cara Delevingne would star in a short film directed by Karl Lagerfeld, we knew we were in for a treat. Now, Chanel has released the teaser trailer for the film, titled "Reincarnation," which will debut alongside its Métiers d&apos;Art collection in Salzburg next week. The film recounts an important moment in the fashion house&apos;s history when founder Coco Chanel, after seeing the uniform of the elevator operator of the Austrian hotel where she vacationed in 1954, was inspired to design the now iconic Chanel jacket. 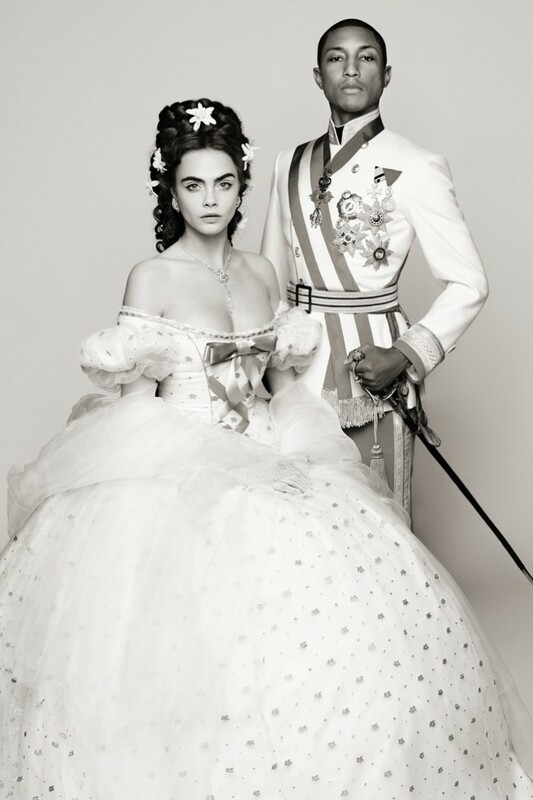 Pharrell plays the elevator operator, who, in an extended dream sequence, is reincarnated as Franz Joseph I, the Emperor of Austria, while Cara Delevingne plays his wife, Empress Elisabeth "Sisi" of Austria. The film is said to feature a song titled, "CC The World," which was produced by Pharrell specifically for the project and features Delevingne singing. Check out the trailer above and some stills from the project below, and watch for the full film to drop on Chanel&apos;s website on Dec. 1. The full “Reincarnation” film is now available to view online. The official premiere will be held in Salzburg at the Chanel Paris-Salzburg 2014/15 Métiers d&apos;art collection showing tomorrow, Dec. 2, but you can check out the the film now below.